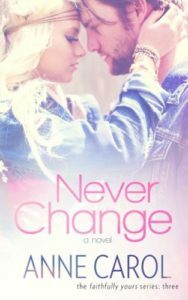 Never Change by Anne Carol is a Christian YA and the third book in the Faithfully Yours series. This is a fabulous series that deals with real life issues – things that people struggle with. Set in 1984, the issues are still the same today. Never Change deals with pregnancy and living with a newborn that presents its own challenges with sleep deprivation and hormones, as well as huge life adjustments. We need to recognise the triggers when sin comes knocking, and firmly close that door.